Hurrah ! Some decent Fish and Chips at last. Ok, so we had to endure the 1845 (actual arrival 1855) from Blackfriars – a station that doesn’t appear to have changed since my last visit thirty years ago – to Herne Hill, but only for ten minutes. A quick pint of Weasel in The Florence which I liked because they were playing reggae but which HS hated and couldn’t wait to drag me out of and then on to Olley’s round the corner. They seem to be pretty keen on self-promotion including a bigger-than-necessary photo of the increasingly ubiquitous Tom “any reasonable offers considered” Parker-Bowles on the frontage but, you know, if the end product is any good, which it was, who cares. Calamari were toothsome and encased in a light, greaseless batter. Scampi were better than is the norm. While waiting for our next course we admired the décor which looked like it belonged in an Alpine-themed restaurant rather than a Fish and Chip shop. One thing we noticed was that the menu listed various ‘experiences’ (set menus) named after various celebrities and also a couple of food critics. The odd thing was they didn’t have one named after a famous food critic who lives right on their doorstep and who actually eats there: Jay Rayner. So HS rang him to find out what the score was. The mains when they arrived were excellent – the Haddock, nestling under a thin crispy batter had not been overcooked and, heavens be praised, was nice and firm and very fresh. Chips were ace. Mushy peas were the real deal. The only disappointments were the pickled onions – we got the small silverskin variety – and the tartare sauce tasted homemade but was a bit smooth. We like it chunky, a bit like ourselves really. It didn’t really spoil the rest of our meal, though. As we couldn’t face pud we settled up and walked round the corner to Jay’s who had kindly invited us round for a nightcap. 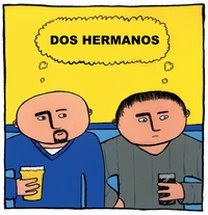 We promised to bring a bottle and HS bought one from the local corner store. He had asked for the best wine the shop had but it turned out even worse than the red Bapi once brought to a New Tayyab’s do. Jay seemed to like it though. Go figure. Luckily, Jay’s wife Pat brought out the Brandy and a fine selection of miniatures they’d collected at the previous evening’s Observer Food Awards so a good time was had by all. 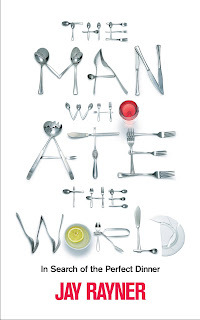 Speaking of Jay, in case you didn’t know, he’s got a book The Man Who Ate The World coming out later this week. I’ve read a pre-publication copy (I promise I’ll buy a proper one) and it’s very enjoyable. Jay writes with an effortless prose and shows an investigative journalist’s nose for a good story. Anyway. If you happen to be in the Herne Hill area (in reality, not something that’s likely to happen to DH again) or happen to be wandering down Railton Road one evening you could do a lot worse than give Olley’s a go. Never did find out about the lack of a “Jay Rayner Experience”, though. I am so confused. Isn't HS's book called "The Man Who Ate My Globe"? The food looks delicous: thank you for kindling my missing appetite. 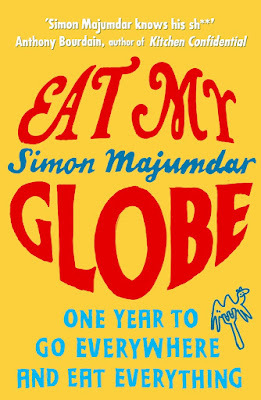 My book is called EAT MY GLOBE. 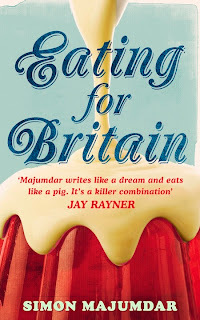 Just got the note from Amazon saying Jay's book had been dispatched, looking forward to reading it. 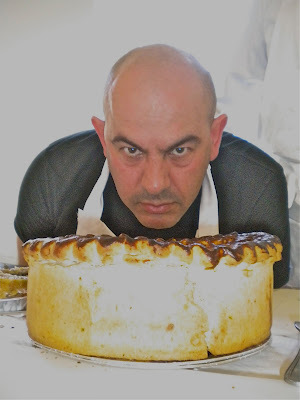 I'm also off to Herne Hill tomorrow, coincidentally, to the Prince Regent. Ever been there yourself? We try not to visit South London - too far for too little reward. That said, if a place looks good to us we'll travel any distance e.g my trip to The Pot Kiln. PS How did your steak go ? Would that be "The Man Who Ate the World" - Featuring SamanthaF?? Bit disappointing to be honest, despite trying twice! I went on Saturday and got a rump steak from Dove's but it was cut too thinly (I should have said something at the time but didn't) and I don't think I heated up the griddle enough so turned out a bit flaccid. Nice enough taste but nowhere near as good as a proper steakhouse. Then on Sunday I cooked a ribeye from Hennessey's over the road, and I'm pretty sure I did everything right - smoking hot griddle, nice thick steak, seasoned and warmed well in advance. And it was *better*, even *good*, but not *great*. My next step is to try a better butcher. Moeb and Sons on the Common are supposed to be good - I'm slowly coming to the conclusion that most places on Northcote Road are overpriced mug-fleecers. Especially the fruit&veg stalls which are so ludicrously overpriced they should have been closed down ages ago. Like I said before it's a deceptively thing cooking a steak. Even renowned places like Peter Luger can sometimes serve sub-par specimens. I'm normally with you on Fish & Chips (Its between Masters and Golden Hinde for me - but Masters is on my way home), but Olley's doesn't really do it for me, just a bit overpriced, a bit full of itself, but the food is fine. I only live in Camberwell but still wouldn't make the trip- a chippy needs to be either local or very good to justify any trip. Yes, they are a bit full on and that did initially make HS a bit wary but just getting to eat some fish that was fresh and that wasn't overcooked - something even one-o-one couldn't manage - put them up there for me. Maybe I've been eating too many mediocre F&C meals and my tastebuds need re-calibrating. Incidentally, it's a while since we've been to the GH. Any recent reports ? I had a really rather good haddock and chips from the bar menu at the Princess in Shoreditch the other day. Might not meet your exacting standards but I'd love to hear your thoughts if you find it on the menu again. We haven't tried The Princess for a while. We used to visit regularly for drinks and meals when it opened (after the refurb). We stopped going when their ale deteriorated pretty rapidly after one particular member of staff left. "He had asked for the best wine the shop had but it turned out even worse than the red Bapi once brought to a New Tayyab’s do"